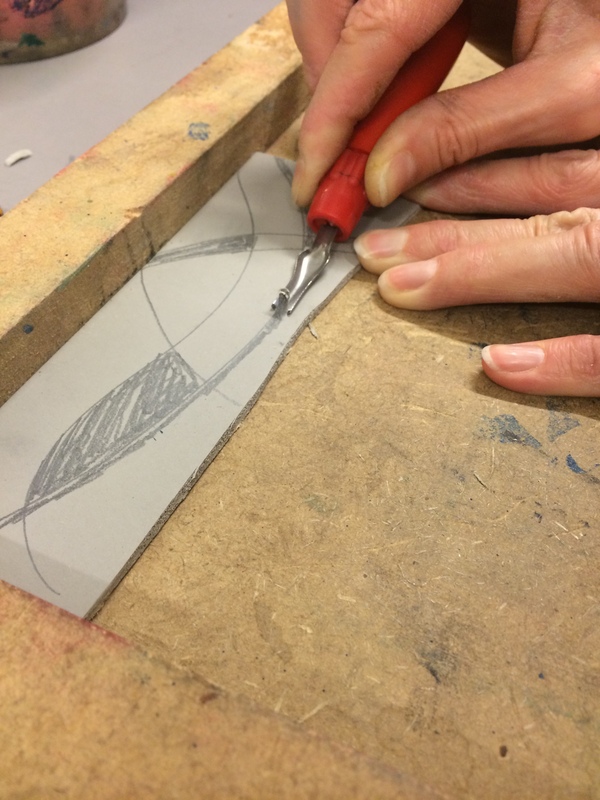 This post is dedicated to Mrs Mole, who asked for detail on how to do a lino block printed textile. I am delighted to help and warmly welcome any requests or suggestions for blog posts. 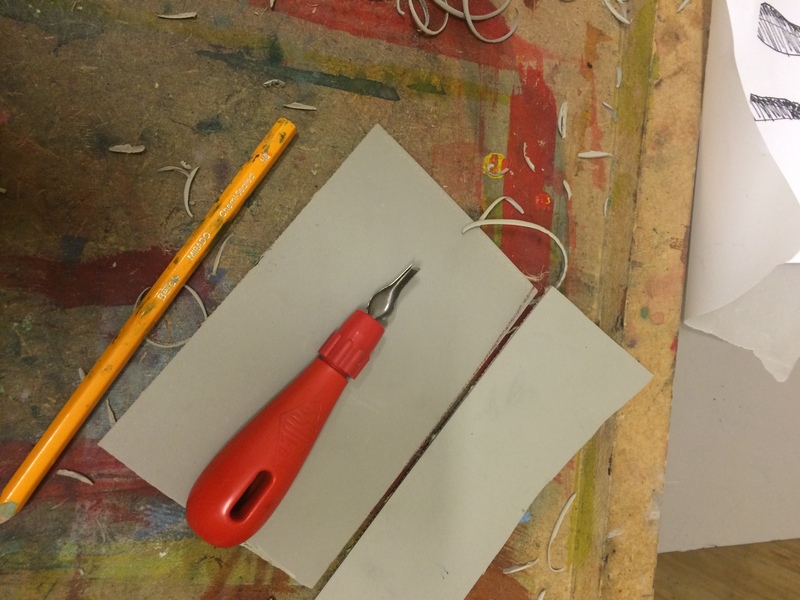 I started with a small piece of lino and a cutting board, a drawing that I wanted to print, and a pencil. 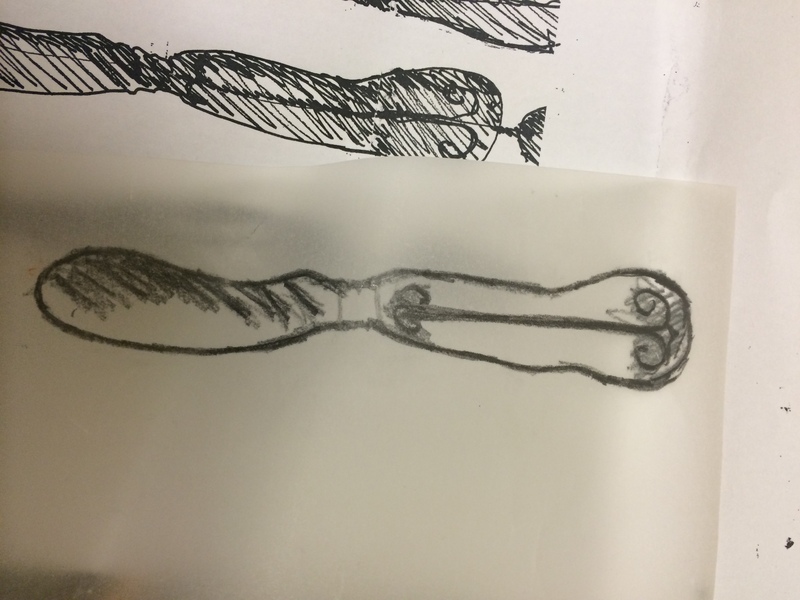 I went back to my original knife sketch and drew around it on to tracing paper. I then rubbed the pencil over the back of the drawing and used this to transfer it to the lino block. Zoe, our teacher, shows how to cut safely, away from your body. I cut out the knife drawing, and then cut away, using scissors, the back ground so that it could be used on my previously printed grey fabric. Here you can see the lino after it has been inked up and applied to the fabric. This is a very small lino block. That is my rubber gloved finger and thumb. 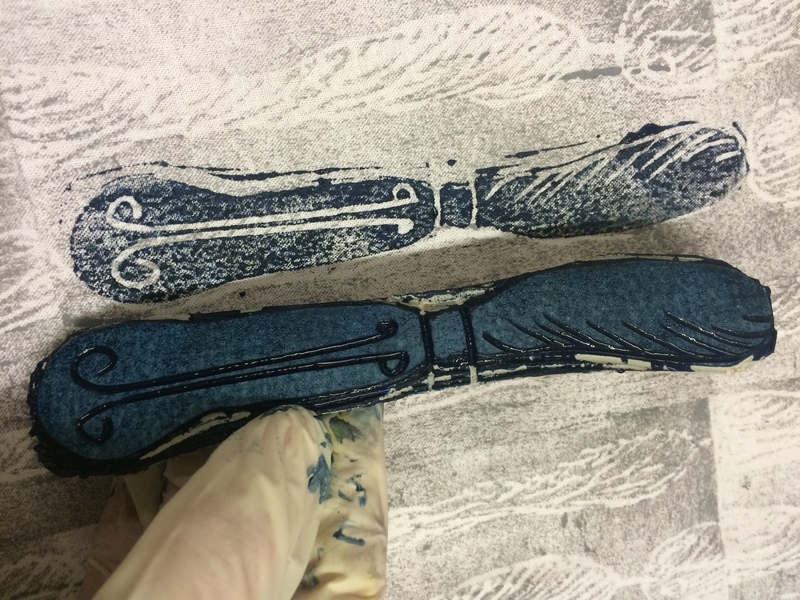 Making a bigger block takes more time but is much quicker when you are printing. 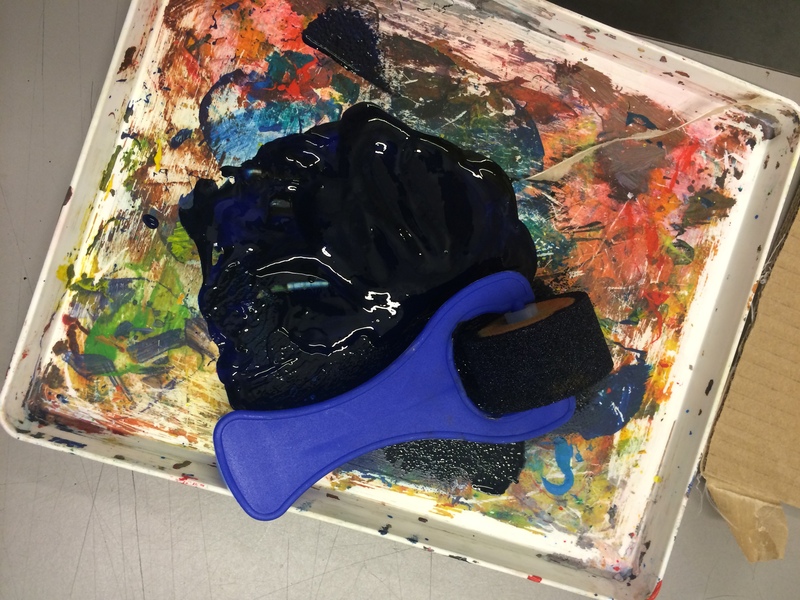 The ink was mixed – blue and black – to make navy. The ink is applied using a foam roller. 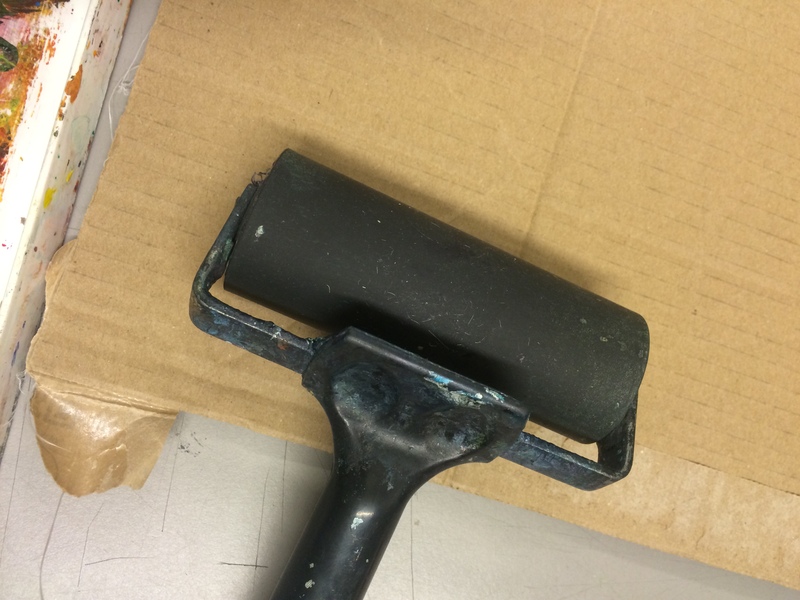 I find it works well to use a rubber brayer to press down the lino print, but it is not essential. After I had used navy blue I also used dark grey and red. I may apply another knife pattern to fill it out, but it maybe OK as it is. 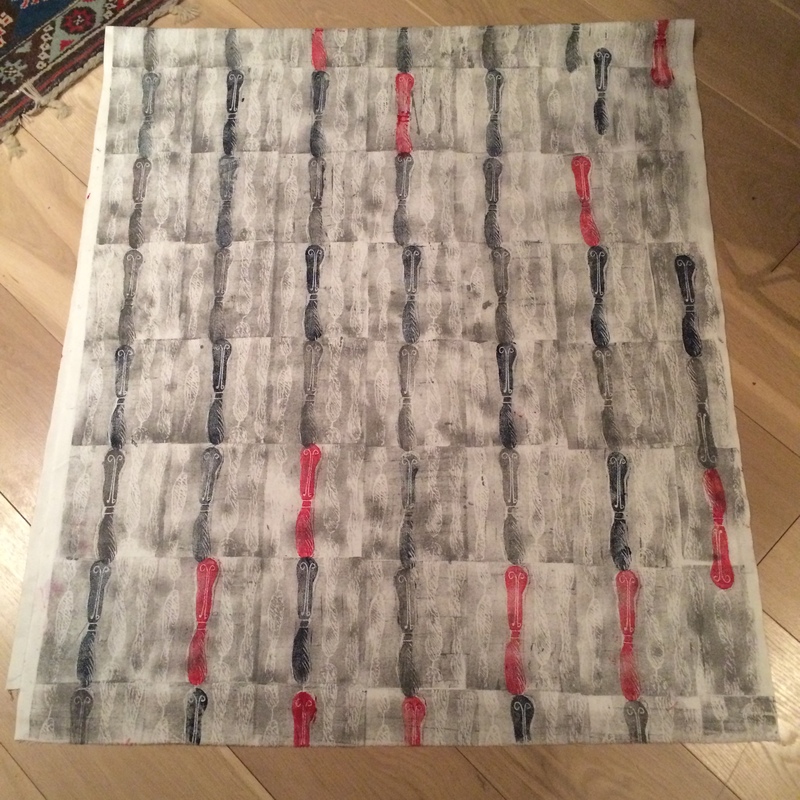 This is about one metre – the fabric is folded in half. I think it needs another knife. I will try to finish this piece of fabric this week, as I am keen to get on with our new project – opposites. I love seeing the results of your printing. I have only tried lino printing once, in high school art class, and I gouged out a piece of my thumb with the carving tool! Oops. Looking forward to seeing your opposites project, too. Great article! Very interesting. I am wondering which brand of ink you were using? It’s Permaset Amandine. Hope this helps. Thank you! Always interesting to know which different products people use!